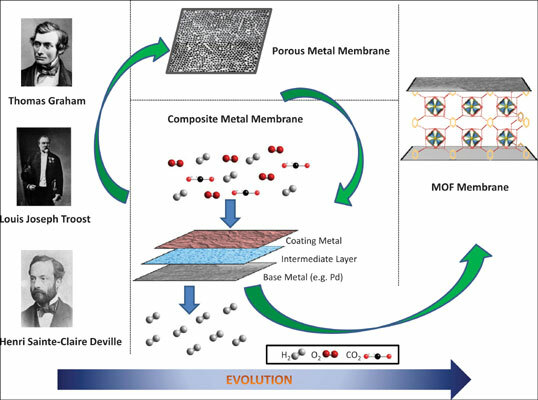 Background: Metal membranes present an alternative approach to conventional membrane materials (polymeric, ceramic), applied mainly for gas separation applications. The major mechanism for the gas permeation though them is called “solution-diffusion” and differs from the respective through the common polymeric membrane materials, hence presenting higher selectivity. Objective: The aim of this article is to provide a general overview of the respective major patents, dealing with metal membranes, especially with those recently published, as well as the alternative ways for manufacturing them, the materials that can be used and the relevant applications. The main focus is given in the composite metal membranes aspects (sulfur resistant etc. ), prepared from metal alloys, although there is also a section describing the metal-organic framework membranes. For this purpose, we revised all patents relating to metal membranes, as well metal organic frameworks. Conclusion: The most patents include inventions about composite metal membranes and methods for manufacture them. Metal membranes are fabricated mainly from alloys containing palladium. Gold is used only to make sulfur resistant membranes. For multilayer membranes the deposition can be occurred via surface activation but usually no chemical activation applied. The most common application for metal membranes is hydrogen separation. On the other hand Metal Organic Frameworks (MOFs) are used as CO2 separators. Metal membranes, gas (hydrogen, CO2) separation, Metal-Organic Frameworks (MOF), composite membranes, sulfur resistant, solution-diffusion.